While Apple has been rumored for a number of years to have been working on a television set project, reports have become more scarce over the past year as interest in a potential smart watch has gained steam. According to a report from NPD DisplaySearch, the rumor trends are indeed a reflection of what is happening at Apple, with the company apparently putting the TV project "on hold again" as wearables such as the "iWatch" have taken priority. However, the hangup has always been the content. The report is not specific about how DisplaySearch has arrived at its conclusion that Apple's TV project has been put on hold, but the firm closely watches the display supply chain and likely is not yet seeing any significant movement toward an Apple television. Apple has reportedly been working on advancing its Apple TV set-top box, but Apple's efforts to revolutionize the television experience will require the company to reach agreements with content providers and cable companies, a process that has been underway for several years but yet to result in any significant progress. Meanwhile, focus on Apple wearables has continued to pick up steam amid continuing rumors that the company is shooting for a late 2014 launch of an iWatch that would run "full iOS". Fueling speculation in recent days has been an announcement that Apple will build a major new manufacturing plant in Arizona to produce sapphire glass. While sapphire is currently used to protect the iPhone's rear camera and the Touch ID sensor of the iPhone 5s, the deal points to a major expansion of Apple's sapphire plans that could include scratch-resistant wearable devices or even full sapphire glass front panels for future iPhones. You mean they won't build TVs that have been rumoured for ages, without one bit of actual evidence, but instead they will work on "wearables", which also have been rumoured for ages, without any bit of actual evidence? 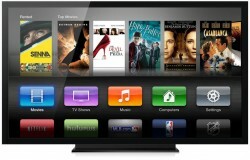 AppleTV is the easiest market for Apple, release an SDK and let the developers do their magic. Yet they continuously shoot themselves in the foot. Even game consoles are integrating media powerhouses. Abandon this ridiculous tv 'set' and focus on the box. This watch better be damn good. While I am disheartened at this news, it is the better business decision. One device per person vs. one device per family is better for the bottom line. Same here. I don't care about the screen. Let me decide what to hook it up to. I just want a more capable ATV. At least in my little world anyway. Makes sense as wearable are the "hot" and growing category here BUT I'd bet whatever Apple's TV plans are they are more delayed by its inability to cobble unique programming deals than anything else. TV is nothing w/o content. It's got to me more than just a TV screen w/ an Apple logo. That's kind of a losing horse out the gate as margins are tight there and even "high end" quality and "large screen" TVs are rather inexpensive. I think apple has a development plan and are not going to stray from it. They (analysts) say one thing and are wrong 95% of the time. I have grown to embrace the "Wait and see" attitude. Apple doesn't care what the world wants. They make something and the world finds a use for it. Its always been that way. Samsung has the opposite approach. Market research along with corporate espionage has them throwing every product under the sun out at the world. wether its good or not. Samsung has become the cartoon version of ACME. Apple conversely has remained focused on a few products that can be used for many things.